This article is about the device for vehicles. For the personal lighting device worn on the head, see Headlamp (outdoor). "Headlight" redirects here. For other uses, see Headlight (disambiguation). "High beam" redirects here. For other uses, see High beam (disambiguation). A headlamp is a lamp attached to the front of a vehicle to light the road ahead. Headlamps are also often called headlights, but in the most precise usage, headlamp is the term for the device itself and headlight is the term for the beam of light produced and distributed by the device. Headlamp performance has steadily improved throughout the automobile age, spurred by the great disparity between daytime and nighttime traffic fatalities: the US National Highway Traffic Safety Administration states that nearly half of all traffic-related fatalities occur in the dark, despite only 25% of traffic travelling during darkness. Other vehicles, such as trains and aircraft, are required to have headlamps. Bicycle headlamps are often used on bicycles, and are required in some jurisdictions. They can be powered by a battery or a small generator mechanically integrated into the workings of the bicycles. One of the first optical headlamp lenses, the Corning Conaphore. Selective yellow "Noviol" glass version shown. The first horseless carriages used carriage lamps, which proved unsuitable for travel at speed. The earliest lights used candles as the most common type of fuel. The earliest headlamps, fueled by acetylene or oil, operated from the late 1880s. Acetylene lamps were popular because the flame is resistant to wind and rain. The first electric headlamps were introduced in 1898 on the Columbia Electric Car from the Electric Vehicle Company of Hartford, Connecticut, and were optional. Two factors limited the widespread use of electric headlamps: the short life of filaments in the harsh automotive environment, and the difficulty of producing dynamos small enough, yet powerful enough to produce sufficient current. The Guide Lamp Company introduced "dipping" (low-beam) headlamps in 1915, but the 1917 Cadillac system allowed the light to be dipped using a lever inside the car rather than requiring the driver to stop and get out. The 1924 Bilux bulb was the first modern unit, having the light for both low (dipped) and high (main) beams of a headlamp emitting from a single bulb. A similar design was introduced in 1925 by Guide Lamp called the "Duplo". In 1927 the foot-operated dimmer switch or dip switch was introduced and became standard for much of the century. 1933–1934 Packards featured tri-beam headlamps, the bulbs having three filaments. From highest to lowest, the beams were called "country passing", "country driving" and "city driving". The 1934 Nash also used a three-beam system, although in this case with bulbs of the conventional two-filament type, and the intermediate beam combined low beam on the driver's side with high beam on the passenger's side, so as to maximise the view of the roadside while minimizing glare toward oncoming traffic. The last vehicles with a foot-operated dimmer switch were the 1991 Ford F-Series and E-Series [Econoline] vans. [citation needed] Fog lamps were new for 1938 Cadillacs,[citation needed] and their 1954 "Autronic Eye" system automated the selection of high and low beams. Directional lighting, using a switch and electromagnetically shifted reflector to illuminate the curbside only, was introduced in the rare, one-year-only 1935 Tatra. Steering-linked lighting was featured on the 1947 Tucker Torpedo's center-mounted headlight, and was later popularized by the Citroen DS. This made it possible to turn the light in the direction of travel when the steering wheel turned, and is now widely adopted technology. The standardized 7-inch (178 mm) round sealed-beam headlamp, one per side, was required for all vehicles sold in the United States from 1940, virtually freezing usable lighting technology in place until the 1970s for Americans. In 1957 the law changed to allow smaller 5.75-inch (146 mm) round sealed beams, two per side of the vehicle, and in 1974 rectangular sealed beams were permitted as well. Technology moved forward in the rest of the world. In 1962 a European consortium of bulb- and headlamp-makers introduced the first halogen lamp for vehicle headlamp use, the H1. Shortly thereafter headlamps using the new light source were introduced in Europe. These were effectively prohibited in the US, where standard-size sealed beam headlamps were mandatory and intensity regulations were low. US lawmakers faced pressure to act, due both to lighting effectiveness and to vehicle aerodynamics/fuel savings. High-beam peak intensity, capped at 140,000 candela per side of the car in Europe, was limited in the United States to 37,500 candela on each side of the car until 1978, when the limit was raised to 75,000. An increase in high-beam intensity to take advantage of the higher allowance could not be achieved without a move to halogen technology, and so sealed-beam headlamps with internal halogen burners became available for use on 1979 models in the United States. As of 2010[update] halogen sealed beams dominate the sealed-beam market, which has declined steeply since replaceable-bulb headlamps were permitted in 1983. High-intensity discharge (HID) systems appeared in the early 1990s, first in the BMW 7 Series. 1996's Lincoln Mark VIII was an early American effort at HIDs, and was the only car with DC HIDs. There was no requirement in Europe for headlamps of standardized size or shape, and lamps could be designed in any shape and size, as long as the lamps met the engineering and performance requirements contained in the applicable European safety standards. Rectangular headlamps were first used in 1961, developed by Cibié for the Citroën Ami 6 and by Hella for the German Ford Taunus. They were prohibited in the United States where round lamps were required until 1975. Another early headlamp styling concept involved conventional round lamps faired into the car's bodywork with aerodynamic glass covers, such as those on the 1961 Jaguar E-Type, and on pre-1967 VW Beetles. In 1940, a consortium of state motor vehicle administrators standardized upon a system of two 7 in (178 mm) round sealed beam headlamps on all vehicles—the only system allowed for 17 years. However, the Tucker 48 included a defining "cyclops-eye" feature: a third center-mounted headlight connected to the car's steering mechanism. It only illuminated if the steering was moved more than ten degrees off center and the high beams were turned on. A system of four round lamps, rather than two, one high/low and one high-beam 5 3⁄4 in (146 mm) sealed beam on each side of the vehicle, was introduced on some 1957 Cadillac, Chrysler, DeSoto, and Nash models in states that permitted the new system. Separate low and high beam lamps eliminated the need for compromise in lens design and filament positioning required in a single unit. Other cars followed suit when all states permitted the new lamps by the time the 1958 models were brought to market. The four-lamp system permitted more design flexibility and improved low and high beam performance. Auto stylists such as Virgil Exner carried out design studies with the low beams in their conventional outboard location, and the high beams vertically stacked at the centreline of the car, but no such designs reached volume production. An example arrangement includes the stacking of two headlamps on each side, with low beams above high beams. The Nash Ambassador used this arrangement in the 1957 model year. Pontiac used this design starting in the 1963 model year; American Motors, Ford, Cadillac, and Chrysler followed two years later. Also in the 1965 model year, the Buick Riviera had concealable stacked headlamps. Various Mercedes models sold in America used this arrangement because their home-market replaceable-bulb headlamps were illegal in the US. In the late 1950s and early 1960s, some Lincoln, Buick, and Chrysler cars had the headlamps arranged diagonally with the low-beam lamps outboard and above the high-beam lamps. British cars including the Gordon-Keeble, Jensen CV8, Triumph Vitesse, and Bentley S3 Continental used such an arrangement as well. In 1968, the newly-initiated Federal Motor Vehicle Safety Standard 108 required all vehicles to have either the twin or quad round sealed beam headlamp system, and prohibited any decorative or protective element in front of an operating headlamp. Glass-covered headlamps like those used on the Jaguar E-Type, pre-1968 VW Beetle, 1965 Chrysler and Imperial models, Porsche 356, Citroën DS, and Ferrari Daytona were no longer permitted, and vehicles had to be equipped with uncovered headlamps for the US market. This made it difficult for vehicles with headlamp configurations designed for good aerodynamic performance to achieve it in their US-market configurations. When FMVSS 108 was amended in 1974 to permit rectangular sealed-beam headlamps, these were placed in horizontally arrayed or vertically stacked pairs. By 1979, the majority of new cars in the US market were equipped with rectangular lamps. [citation needed] As previously with round lamps, the US permitted only two standardized sizes of rectangular sealed-beam lamp: A system of two 200 by 142 mm (7.9 by 5.6 in) high/low beam units corresponding to the existing 7-inch round format, or a system of four 165 by 100 mm (6.5 by 3.9 in) units, two high/low and two high-beam. corresponding to the existing 5 3⁄4 in (146 mm) round format. In 1983, granting a 1981 petition from Ford Motor Company, the US headlamp regulations were amended to allow replaceable-bulb, nonstandard-shape, architectural headlamps with aerodynamic lenses that could for the first time be made of hard-coated polycarbonate. This allowed the first US-market car since 1939 with replaceable bulb headlamps: the 1984 Lincoln Mark VII. These composite headlamps were sometimes referred to as "Euro" headlamps, since aerodynamic headlamps were common in Europe. Though conceptually similar to European headlamps with non-standardized shape and replaceable-bulb construction, these headlamps conform to the headlamp design, construction, and performance specifications of US Federal Motor Vehicle Safety Standard 108 rather than the internationalized European safety standards used outside North America. Nevertheless, this change to US regulations made it possible for headlamp styling in the US market to move closer to that in Europe. Hidden headlamps were introduced in 1936, on the Cord 810/812. They were mounted in the front fenders, which were smooth until the lights were cranked out—each with its own small dash-mounted crank—by the operator. They aided aerodynamics when the headlamps were not in use, and were among the Cord's signature design features. Later hidden headlamps require one or more vacuum-operated servos and reservoirs, with associated plumbing and linkage, or electric motors, geartrains and linkages to raise the lamps to an exact position to assure correct aiming despite ice, snow and age. Some hidden headlamp designs, such as those on the Saab Sonett III, used a lever-operated mechanical linkage to raise the headlamps into position. During the 1960s and 1970s many notable sports cars used this feature such as the Chevrolet Corvette (C3), Ferrari Berlinetta Boxer and Lamborghini Countach as they allowed low bonnet lines but raised the lights to the required height, but since 2004 no modern volume-produced car models use hidden headlamps, because they present difficulties in complying with pedestrian-protection provisions added to international auto safety regulations regarding protuberances on car bodies to minimize injury to pedestrians struck by cars. Some hidden headlamps themselves do not move, but rather are covered when not in use by panels designed to blend in with the car's styling. When the lamps are switched on, the covers are swung out of the way, usually downward or upward, for example on the 1992 Jaguar XJ220. The door mechanism may be actuated by vacuum pots, as on some Ford vehicles of the late 1960s through early 1980s such as the 1967–1970 Mercury Cougar, or by an electric motor as on various Chrysler products of the middle 1960s through late 1970s such as the 1966–1967 Dodge Charger. The international ECE Regulations for filament headlamps and for high-intensity discharge headlamps specify a beam with a sharp, asymmetric cutoff preventing significant amounts of light from being cast into the eyes of drivers of preceding or oncoming cars. Control of glare is less strict in the North American SAE beam standard contained in FMVSS / CMVSS 108.
International ECE Regulations permit higher-intensity high-beam headlamps than are allowed under North American regulations. Headlamp sold in Sweden not long before Dagen H changeover from left to right hand traffic. Opaque decal blocks the lens portion for low beam upkick to the right, and bears warning: "Not to be removed before 3 September 1967". Most low-beam headlamps are specifically designed for use on only one side of the road. Headlamps for use in left-traffic countries have low-beam headlamps that "dip to the left"; the light is distributed with a downward/leftward bias to show the driver the road and signs ahead without blinding oncoming traffic. Headlamps for right-traffic countries have low beams that "dip to the right", with most of their light directed downward/rightward. Because wrong-side-of-road headlamps blind oncoming drivers and do not adequately light the driver's way, and blackout strips and adhesive prismatic lenses reduce the safety performance of the headlamps, some countries require all vehicles registered or used on a permanent or semi-permanent basis within the country to be equipped with headlamps designed for the correct traffic-handedness. North American vehicle owners sometimes privately import and install Japanese-market (JDM) headlamps on their car in the mistaken belief that the beam performance will be better, when in fact such misapplication is quite hazardous and illegal. Vehicle headlamps have been found unable to illuminate an assured clear distance ahead at speeds above 60 km/h (40 mph). It may be unsafe and, in a few areas, illegal to drive above this speed at night. In North America, the design, performance and installation of all motor vehicle lighting devices are regulated by Federal and Canada Motor Vehicle Safety Standard 108, which incorporates SAE technical standards. Elsewhere in the world, ECE internationalized regulations are in force either by reference or by incorporation in individual countries' vehicular codes. US laws required sealed beam headlamps on all vehicles between 1940 and 1983, and other countries such as Japan, United Kingdom and Australia also made extensive use of sealed beams.[when?] In most other countries, and in the US since 1984, replaceable-bulb headlamps predominate. Previous ECE regulations also permitted selective yellow light. A research experiment done in the UK in 1968 using tungsten (non-halogen) lamps found that visual acuity is about 3% better with selective yellow headlamps than with white ones of equal intensity. Research done in the Netherlands in 1976 concluded that yellow and white headlamps are equivalent as regards traffic safety, though yellow light causes less discomfort glare than white light. Researchers note that tungsten filament lamps emit only a small amount of the blue light blocked by a selective-yellow filter, so such filtration makes only a small difference in the characteristics of the light output, and suggest that headlamps using newer kinds of sources such as metal halide (HID) bulbs may, through filtration, give off less visually distracting light while still having greater light output than halogen ones. The French yellow-light mandate was based on observations by the French Academy of Sciences in 1934, when the Academy recorded that the selective yellow light was less dazzling than white light and that the light diffused less in fog than green or blue lights. [citation needed] Yellow light was obtained by dint of yellow glass for the headlight bulb or lens, a yellow coating on a colourless bulb, lens, or reflector, or a yellow filter between the bulb and the lens. Filtration losses reduced the emitted light intensity by about 18 percent, which might have contributed to the reduced glare. The requirement was criticised as a trade barrier in the automobile sector; French politician Jean-Claude Martinez described it as a protectionist law. Formal research found, at best, a small improvement in visual acuity with yellow rather than white headlights, and French automaker Peugeot estimated that white headlamps produce 20 to 30 percent more light—though without explaining why this estimate was larger than the 15% to 18% value measured in formal research—and wanted drivers of their cars to get the benefits of extra illumination. More generally, country-specific vehicle technical regulations in Europe were regarded as a costly nuisance. In a survey published in 1988, automakers gave a range of responses when asked what it cost to supply a car with yellow headlamps for France. General Motors and Lotus said there was no additional cost, Rover said the additional cost was marginal, and Volkswagen said yellow headlamps added 28 Deutsche Marks to the cost of vehicle production. Addressing the French requirement for yellow lights (among other country-specific lighting requirements) was undertaken as part of an effort toward common vehicle technical standards throughout the European Community. A provision in EU Council Directive 91/663, issued on 10 December 1991, specified white headlamps for all new vehicle type-approvals granted by the EC after 1 January 1993 and stipulated that from that date EC (later EU) member states would not be permitted to refuse entry of a vehicle meeting the lighting standards contained in the amended document—so France would no longer be able to refuse entry to a vehicle with white headlights. The directive was adopted unanimously by the council, and hence with France's vote. A 7 in (180 mm) round sealed-beam headlamp with lens optics on a Jaguar E-type. The flutes and prisms spread and distribute the light collected by the reflector. A reflector-optic headlamp on a Jeep Liberty. The clear front cover lens serves only a protective function. Starting in the 1980s, headlamp reflectors began to evolve beyond the simple stamped steel parabola. The 1983 Austin Maestro was the first vehicle equipped with Lucas-Carello's homofocal reflectors, which comprised parabolic sections of different focal length to improve the efficiency of light collection and distribution. CAD technology allowed the development of reflector headlamps with nonparabolic, complex-shape reflectors. First commercialised by Valeo under their Cibié brand, these headlamps would revolutionise automobile design. The 1987 US-market Dodge Monaco/Eagle Premier twins and European Citroën XM were the first cars with complex-reflector headlamps with faceted optic lenses. General Motors' Guide Lamp division in America had experimented with clear-lens complex-reflector lamps in the early 1970s and achieved promising results, but the US-market 1990 Honda Accord was first with clear-lens multi-reflector headlamps; these were developed by Stanley in Japan. Modern reflectors are commonly made of compression-moulded or injection moulded plastic, though glass and metal optic reflectors also exist. The reflective surface is vapour deposited aluminum, with a clear overcoating to prevent the extremely thin aluminium from oxidizing. Extremely tight tolerances must be maintained in the design and production of complex-reflector headlamps. One filament is located at the focal point of the reflector. The other filament is shifted axially and radially away from the focal point. In most 2-filament sealed beams and in 2-filament replaceable bulbs of type 9004, 9007, and H13, the high-beam filament is at the focal point and the low-beam filament is off focus. For use in right-traffic countries, the low-beam filament is positioned slightly upward, forward and leftward of the focal point, so that when it is energized, the beam is widened and shifted slightly downward and rightward of the headlamp axis. Transverse-filament bulbs such as the 9004 can only be used with the filaments horizontal, but axial-filament bulbs can be rotated or "clocked" by the headlamp designer to optimize the beam pattern or to effect the traffic-handedness of the low beam. The latter is accomplished by clocking the low-beam filament in an upward-forward-leftward position to produce a right-traffic low beam, or in an upward-forward-rightward position to produce a left-traffic low beam. The traditional European method of achieving low and high beam from a single bulb involves two filaments along the axis of the reflector. The high beam filament is on the focal point, while the low beam filament is approximately 1 cm forward of the focal point and 3 mm above the axis. Below the low beam filament is a cup-shaped shield (called a "Graves shield") spanning an arc of 165°. When the low beam filament is illuminated, this shield casts a shadow on the corresponding lower area of the reflector, blocking downward light rays that would otherwise strike the reflector and be cast above the horizon. The bulb is rotated (or "clocked") within the headlamp to position the Graves shield so as to allow light to strike a 15° wedge of the lower half of the reflector. This is used to create the upsweep or upstep characteristic of ECE low beam light distributions. The bulb's rotative position within the reflector depends on the type of beam pattern to be produced and the traffic directionality of the market for which the headlamp is intended. In this system a filament is located at one focus of an ellipsoidal reflector and has a condenser lens at the front of the lamp. A shade is located at the image plane, between the reflector and lens, and the projection of the top edge of this shade provides the low-beam cutoff. The shape of the shade edge and its exact position in the optical system determine the shape and sharpness of the cutoff. The shade may be lowered by a solenoid actuated pivot to provide low beam, and removed from the light path for high beam. Such optics are known as BiXenon or BiHalogen projectors. If the cutoff shade is fixed in the light path, separate high-beam lamps are required. The condenser lens may have slight fresnel rings or other surface treatments to reduce cutoff sharpness. Modern condenser lenses incorporate optical features specifically designed to direct some light upward towards the locations of retroreflective overhead road signs. Hella introduced ellipsoidal optics for acetylene headlamps in 1911, but following the electrification of vehicle lighting, this optical technique wasn't used for many decades. The first modern polyellipsoidal (projector) automotive lamp was the Super-Lite, an auxiliary headlamp produced in a joint venture between Chrysler Corporation and Sylvania and optionally installed in 1969 and 1970 full-size Dodge automobiles. It used an 85 watt transverse-filament tungsten-halogen bulb and was intended as a mid-beam, to extend the reach of the low beams during turnpike travel when low beams alone were inadequate but high beams would produce excessive glare. Projector main headlamps first appeared in 1981 on the Audi Quartz, the Quattro-based concept car designed by Pininfarina for Geneva Auto Salon. [citation needed] Developed more or less simultaneously in Germany by Hella and Bosch and in France by Cibié, the projector low beam permitted accurate beam focus and a much smaller-diameter optical package, though a much deeper one, for any given beam output. The version of the 1986 BMW 7 Series (E32) sold outside North America was the first volume-production auto to use polyellipsoidal low beam headlamps. The main disadvantage of this type of headlamp is the need to accommodate the physical depth of the assembly, which may extend far back into the engine compartment. The H1 lamp was the first tungsten-halogen headlamp light source. It was introduced in 1962 by a consortium of European bulb and headlamp makers. This bulb has a single axial filament that consumes 55 watts at 12.0 volts, and produces 1550 lumens ±15% when operated at 13.2 V. H2 (55 W @ 12.0 V, 1820 lm @ 13.2 V) followed in 1964, and the transverse-filament H3 (55 W @ 12.0 V, 1450 lm ±15%) in 1966. H1 still sees wide use in low beams, high beams and auxiliary fog and driving lamps, as does H3. The H2 is no longer a current type, since it requires an intricate bulb holder interface to the lamp, has a short life and is difficult to handle. For those reasons, H2 was withdrawn from ECE Regulation 37 for use in new lamp designs (though H2 bulbs are still manufactured for replacement purposes in existing lamps), but H1 and H3 remain current and these two bulbs were legalised in the United States in 1993. More recent single-filament bulb designs include the H7 (55 W @ 12.0 V, 1500 lm ±10% @ 13.2 V), H8 (35 W @ 12.0 V, 800 lm ±15% @ 13.2 V), H9 (65 W @ 12.0 V, 2100 lm ±10% @ 13.2 V), and H11 (55 W @ 12.0 V, 1350 lm ±10% @ 13.2 V). 24-volt versions of many bulb types are available for use in trucks, buses, and other commercial and military vehicles. A further development of the tungsten-halogen bulb has a dichroic coating that passes visible light and reflects infrared radiation. The glass in such a bulb may be spherical or tubular. The reflected infrared radiation strikes the filament located at the centre of the glass envelope, heating the filament to a greater degree than can be achieved through resistive heating alone. The superheated filament emits more light without an increase in power consumption. Automotive HID may be called "xenon headlamps", though they are actually metal-halide lamps that contain xenon gas. The xenon gas allows the lamps to produce minimally adequate light immediately upon start, and shortens the run-up time. The usage of argon, as is commonly done in street lights and other stationary metal-halide lamp applications, causes lamps to take several minutes to reach their full output. In 1992 the first production low beam HID headlamps were manufactured by Hella and Bosch beginning in 1992 for optional availability on the BMW 7 Series. This first system uses a built-in, non-replaceable burner without a UV-blocking glass shield or touch-sensitive electrical safety cutout, designated D1 – a designation that would be recycled years later for a wholly different type of burner. The AC ballast is about the size of a building brick. In 1996 the first American-made effort at HID headlamps was on the 1996–98 Lincoln Mark VIII, which uses reflector headlamps with an unmasked, integral-ignitor burner made by Sylvania and designated Type 9500. This was the only system to operate on DC, since reliability proved inferior to the AC systems. [citation needed] The Type 9500 system was not used on any other models, and was discontinued after Osram's takeover of Sylvania in 1997. [citation needed] All HID headlamps worldwide presently use the standardized AC-operated bulbs and ballasts. In 1999 the first worldwide bi-xenon HID headlights for both low and high beam were introduced on the Mercedes-Benz CL-Class. Ignition: a high voltage pulse is used to produce an electrical arc – in a manner similar to a spark plug – which ionizes the xenon gas, creating a conducting channel between the tungsten electrodes. Electrical resistance is reduced within the channel, and current flows between the electrodes. Continuous operation: all metal salts are in the vapor phase, the arc has attained its stable shape, and the luminous efficacy has attained its nominal value. The ballast now supplies stable electrical power so the arc will not flicker. Stable operating voltage is 85 volts AC in D1 and D2 systems, 42 volts AC in D3 and D4 systems. The frequency of the square-wave alternating current is typically 400 hertz or higher. The correlated color temperature of factory installed automotive HID headlamps is between 4100K and 5000K[citation needed] while tungsten-halogen lamps are at 3000K to 3550K. The spectral power distribution (SPD) of an automotive HID headlamp is discontinuous and spikey while the SPD of a filament lamp, like that of the sun, is a continuous curve. Moreover, the color rendering index (CRI) of tungsten-halogen headlamps (98) is much closer than that of HID headlamps (~75) to standardized sunlight (100). Studies have shown no significant safety effect of this degree of CRI variation in headlighting. Luminous efficacy is the measure of how much light is produced versus how much energy is consumed. HID burners give higher efficacy than halogen lamps. The highest-intensity halogen lamps, H9 and HIR1, produce 2100 to 2530 lumens from approximately 70 watts at 13.2 volts. A D2S HID burner produces 3200 lumens from approximately 42 watts during stable operation. The reduced power consumption means less fuel consumption, with resultant less CO2 emission per vehicle fitted with HID lighting (1.3 g/km assuming that 30% of engine running time is with the lights on). Vehicles equipped with HID headlamps (except motorcycles) are required by ECE regulation 48 also to be equipped with headlamp lens cleaning systems and automatic beam leveling control. Both of these measures are intended to reduce the tendency for high-output headlamps to cause high levels of glare to other road users. In North America, ECE R48 does not apply and while lens cleaners and beam levelers are permitted, they are not required; HID headlamps are markedly less prevalent in the US, where they have produced significant glare complaints. Scientific study of headlamp glare has shown that for any given intensity level, the light from HID headlamps is 40% more glaring than the light from tungsten-halogen headlamps. HID headlamp bulb types D1R, D1S, D2R, D2S and 9500 contain the toxic heavy metal mercury. The disposal of mercury-containing vehicle parts is increasingly regulated throughout the world, for example under US EPA regulations. Newer HID bulb designs D3R, D3S, D4R, and D4S which are in production since 2004 contain no mercury, but are not electrically or physically compatible with headlamps designed for previous bulb types. Automotive headlamp applications using light-emitting diodes (LEDs) have been undergoing very active development since 2004. In 2006 the first series-production LED low beams were factory-installed on the Lexus LS 600h / LS 600h L. The high beam and turn signal functions used filament bulbs. The headlamp was supplied by Koito. In 2007 the first headlamps with all functions provided by LEDs, supplied by AL-Automotive Lighting, were introduced on the V10 Audi R8 sports car (except in North America). In 2010 the first all-LED headlamps with adaptive high beam and what Mercedes called the "Intelligent Light System" were introduced on the 2011 Mercedes CLS. In 2013 the first digitally controlled full-LED glare-free "Matrix LED" adaptive headlamps were introduced by Audi on the facelifted A8, with 25 individual LED segments. The system dims light that would shine directly onto oncoming and preceding vehicles, but continues to cast its full light on the zones between and beside them. This works because the LED high beams are split into numerous individual light-emitting diodes. High-beam LEDs in both headlights are arranged in a matrix and adapt fully electronically to the surroundings in milliseconds. They are activated and deactivated or dimmed individually by a control unit. In addition, the headlights also function as a cornering light. Using predictive route data supplied by the MMI navigation plus, the focus of the beam is shifted towards the bend even before the driver turns the steering wheel. In 2014: Mercedes-Benz introduced a similar technology on the facelifted CLS-Class in 2014, called MULTIBEAM LED, with 24 individual segments. As of 2010, LED headlamps such as those available on the Toyota Prius were giving performance between halogen and HID headlamps, with system power consumption slightly lower than other headlamps, longer lifespans and more flexible design possibilities. As LED technology continues to evolve, the performance of LED headlamps was predicted to improve to approach, meet, and perhaps one day surpass that of HID headlamps. That occurred by mid-2013, when the Mercedes S-Class came with LED headlamps giving higher performance than comparable HID setups. Before LEDs, all light sources used in headlamps (tungsten, halogen, HID) emitted infrared energy that can thaw built-up snow and ice off a headlamp lens and prevent further accumulation. LEDs do not. Some LED headlamps move heat from the heat sink on the back of the LEDs to the inner face of the front lens to warm it up,[citation needed] while on others no provision is made for lens thawing. A laser lamp uses mirrors to direct a laser on to a phosphor that then emits a light. Laser lamps use half as much power as LED lamps. They were first developed by Audi for use as headlamps in the 24 Hours of Le Mans. Automatic systems for activating the headlamps have been available since the mid-1960s,[citation needed] originally only on luxury American models such as Cadillac, Lincoln and Imperial. [citation needed] Basic implementations turn the headlights on at dusk and off at dawn. Modern implementations use sensors to detect the amount of exterior light. UN R48 has mandated the installation of automatic headlamp since July 30, 2016. With Daytime running lamp equipped and operated, the dipped beam headlamp should automatically turn on if the car is driving in less than 1,000 lux ambient condition (Automatic switching condition), such as in tunnel and in dark environment. while driving in tunnel or dark environment, Daytime running lamp would make glare more evident to the upcoming vehicle driver, which in turn would influence the upcoming vehicle driver's eyesight, such that, by automatically switching the Daytime running lamp to the dipped-beam headlamp, the inherent safety defect could be solved and safety benefit ensured. The 1948 Citroen 2CV was launched in France with a manual headlamp leveling system, controlled by the driver with a knob through a mechanical rod linkage. This allowed the driver to adjust the vertical aim of the headlamps to compensate for the passenger and cargo load in the vehicle. In 1954, Cibié introduced an automatic headlamp leveling system linked to the vehicle's suspension system to keep the headlamps correctly aimed regardless of vehicle load, without driver intervention. The first vehicle to be so equipped was the Panhard Dyna Z. Beginning in the 1970s, Germany and some other European countries began requiring remote-control headlamp leveling systems that permit the driver to lower the lamps' aim by means of a dashboard control lever or knob if the rear of the vehicle is weighted down with passengers or cargo, which would tend to raise the lamps' aim angle and create glare. Such systems typically use stepper motors at the headlamp and a rotary switch on the dash marked "0", "1", "2", "3" for different beam heights, "0" being the "normal" (and highest) position for when the car is lightly loaded. Internationalized ECE Regulation 48, in force in most of the world outside North America, currently specifies a limited range within which the vertical aim of the headlamps must be maintained under various vehicle load conditions; if the vehicle isn't equipped with an adaptive suspension sufficient to keep the headlamps aimed correctly regardless of load, a headlamp leveling system is required. The regulation stipulates a more stringent version of this anti-glare measure if the vehicle has headlamps with low beam light source(s) that produce more than 2,000 lumens – xenon bulbs and certain high-power halogens, for example. Such vehicles must be equipped with headlamp self-leveling systems that sense the vehicle's degree of squat due to cargo load and road inclination, and automatically adjust the headlamps' vertical aim to keep the beam correctly oriented without any action required by the driver. Directional (steering) headlamps on a Citroën DS – the driver can see clearly through curves. These provide improved lighting for cornering. Some automobiles have their headlamps connected to the steering mechanism so the lights will follow the movement of the front wheels. Czechoslovak Tatra was an early implementer of such a technique, producing in the 1930s a vehicle with a central directional headlamp. The American 1948 Tucker Sedan was likewise equipped with a third central headlamp connected mechanically to the steering system. The 1967 French Citroën DS and 1970 Citroën SM were equipped with an elaborate dynamic headlamp positioning system that adjusted the inboard headlamps' horizontal and vertical position in response to inputs from the vehicle's steering and suspension systems. At that time US regulations required this system to be removed from those models sold in the U.S. Even when conditions would warrant the use of high-beam headlamps, drivers often do not use them. There have long been efforts, particularly in America, to devise an effective automatic beam selection system to relieve the driver of the need to select and activate the correct beam as traffic, weather, and road conditions change. 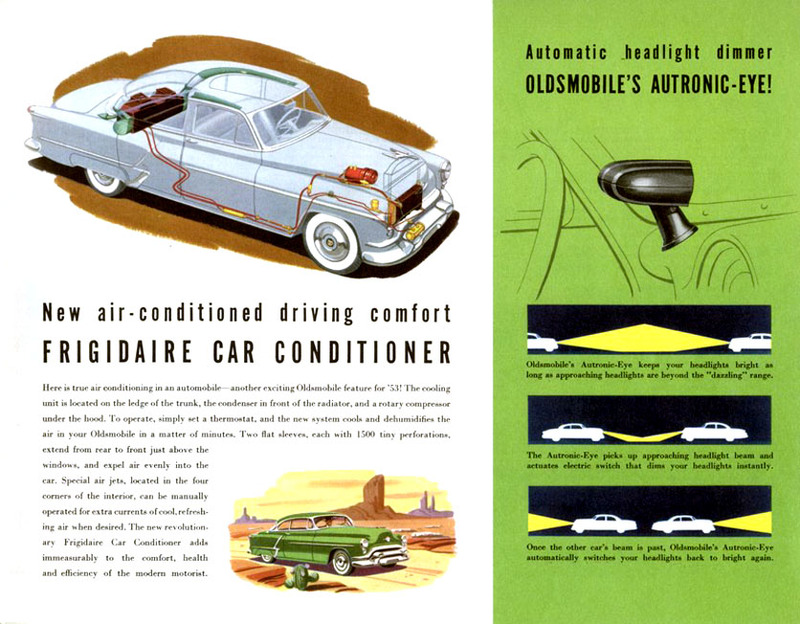 General Motors introduced the first automatic headlight dimmer called the 'Autronic Eye' in 1952 on their Cadillac, Buick, and Oldsmobile models; the feature was offered in other GM vehicles starting in 1953. The system's photoresistor and associated circuitry were housed in a gunsight-like tube atop the dashboard. An amplifier module was located in the engine compartment that controlled the headlight relay using signals from the dashboard-mounted tube unit. Though the systems based on photoresistors evolved, growing more compact and moving from the dashboard to a less conspicuous location behind the radiator grill, they were still unable to reliably discern headlamps from non-vehicular light sources such as streetlights. They also did not dip to low beam when the driver approached a vehicle from behind, and they would spuriously dip to low beam in response to road sign reflections of the vehicle's own high beam headlamps. American inventor Jacob Rabinow devised and refined a scanning automatic dimmer system impervious to streetlights and reflections, but no automaker purchased the rights, and the problematic photoresistor type remained on the market through the late 1980s. Present systems based on imaging CMOS cameras can detect and respond appropriately to leading and oncoming vehicles while disregarding streetlights, road signs, and other spurious signals. Camera-based beam selection was first released in 2005 on the Jeep Grand Cherokee and has since then been incorporated into comprehensive driver assistance systems by automakers worldwide. The headlights will dim when a bright reflection bounces off of a street sign. Adaptive Highbeam Assist is Mercedes-Benz' marketing name for a headlight control strategy that continuously automatically tailors the headlamp range so the beam just reaches other vehicles ahead, thus always ensuring maximum possible seeing range without glaring other road users. It was first launched in the Mercedes E-class in 2009. It provides a continuous range of beam reach from a low-aimed low beam to a high-aimed high beam, rather than the traditional binary choice between low and high beams. The range of the beam can vary between 65 and 300 meters, depending on traffic conditions. In traffic, the low beam cutoff position is adjusted vertically to maximise seeing range while keeping glare out of leading and oncoming drivers' eyes. When no traffic is close enough for glare to be a problem, the system provides full high beam. Headlamps are adjusted every 40 milliseconds by a camera on the inside of the front windscreen which can determine distance to other vehicles. The S-Class, CLS-Class and C-Class also offer this technology. In the CLS, the adaptive high beam is realised with LED headlamps - the first vehicle producing all adaptive light functions with LEDs. Since 2010 some Audi models with Xenon headlamps are offering a similar system: adaptive light with variable headlight range control. In Japan, the Toyota Crown, Toyota Crown Majesta, Nissan Fuga and Nissan Cima offer the technology on top level models. The first mechanically controlled (non-LED), glare-free high beam was Volkswagen's "Dynamic Light Assist" package, which was introduced in 2010 on the Volkswagen Touareg, Phaeton, and Passat. In 2012, the facelifted Lexus LS (XF40) introduced an identical bi-xenon system: "Adaptive High-beam System". The first mechanically controlled LED glare-free headlamps were introduced in 2012 on BMW 7 Series: "Selective Beam" (anti-dazzle high-beam assistant). In 2013 Mercedes-Benz introduced the same LED system: "Adaptive Highbeam Assist Plus". The first digitally controlled LED glare-free headlamps were introduced in 2013 on Audi A8. See LED section. Headlamp systems require periodic maintenance. Sealed beam headlamps are modular; when the filament burns out, the entire sealed beam is replaced. Most vehicles in North America made since the late 1980s use headlamp lens-reflector assemblies that are considered a part of the car, and just the bulb is replaced when it fails. Manufacturers vary the means by which the bulb is accessed and replaced. Headlamp aim must be properly checked and adjusted frequently, for misaimed lamps are dangerous and ineffective. Over time, the headlamp lens can deteriorate. It can become pitted due to abrasion of road sand and pebbles and can crack, admitting water into the headlamp. "Plastic" (polycarbonate) lenses can become cloudy and discoloured. This is due to oxidation of the painted-on lens hardcoat by ultraviolet light from the sun and the headlamp bulbs. If it is minor, it can be polished out using a reputable brand of a car polish that is intended for restoring the shine to chalked paint. In more advanced stages, the deterioration extends through the actual plastic material, rendering the headlamp useless and necessitating complete replacement. Sanding or aggressively polishing the lenses, or plastic headlight restoration, can buy some time, but doing so removes the protective coating from the lens, which when so stripped will deteriorate faster and more severely. Dirt buildup on headlamp lenses increases glare to other road users, even at levels too low to reduce seeing performance significantly for the driver. [citation needed] Therefore, headlamp lens cleaners are required by UN Regulation 48 on vehicles equipped with low-beam headlamps using light sources that have a reference luminous flux of 2,000 lumens or more. This includes all HID headlamps and some high-power halogen units. Some cars have lens cleaners fitted even where the regulations do not require them. North America, for example, does not use UN regulations, and FMVSS 108 does not require lens cleaners on any headlamps, though they are permitted. ^ Varghese, Cherian; Shankar, Umesh (May 2007). "Passenger Vehicle Occupant Fatalities by Day and Night – A Contrast" (PDF). Traffic Safety Facts, Research Note (DOT HS 810 637). Retrieved 29 May 2014. ^ Gray, William (1907). "Generators". Harper's Weekly. Vol. 51. Retrieved 2018-04-22. [...] as the first automobile close [...] followed the carriage in design and construction, so the first lamp that was used on the automobile was the carriage lamp. These carriage lamps were found to be unsuitable for the fast-moving auto. ^ Georgano, G. N. (2002). Cars: Early and Vintage, 1886-1930 (A World of Wheels Series). Mason Crest. ISBN 978-1-59084-491-5. ^ Rumar, Kåre (November 2000). "Relative Merits of the U.S. and ECE High-Beam Maximum Intensities and of Two- and Four-Headlamp Systems" (PDF). University of Michigan Transportation Research Institute. Retrieved 2014-12-13. ^ a b c Ehrhardt, Ralph A. (1979). "Halogen Sealed Beam Headlamps". Retrieved 2014-12-13. ^ a b Moore, David W. (June 1998). "Headlamp History and Harmonization" (PDF). Motor Vehicle Lighting. Retrieved 2014-12-13. ^ Auto Editors of Consumer Guide (13 June 2007). "How Tucker Cars Work". HowStuffWorks.com. Retrieved 15 March 2019. ^ Lehto, Steve; Leno, Jay (2016). Preston Tucker and His Battle to Build the Car of Tomorrow. Chicago Review Press. ISBN 9781613749562. Retrieved 15 March 2019. ^ Olson, Paul L. (19 December 1977). "The relative merits of different low beam headlighting systems - a review of the literature. Final report". deepblue.lib.umich.edu. Highway Safety Research Institute. Retrieved 15 March 2019. ^ Rowsome, Frank Jr. (August 1956). "Why Cars are Going to Four Headlights". Popular Science. pp. 65–69. Retrieved 14 March 2019. ^ Forkum, Allen (1 October 2018). "1957 Nash Ambassador". AutoGraphic's Automotive Report. Retrieved 15 March 2019. ^ a b "Whatever Happened to Pop-Up Headlights?". Slate. 22 October 2013. Retrieved 4 January 2015. ^ "Driving Abroad: Headlights". UK Automobile Association. 1 August 2012. Retrieved 29 May 2014. ^ "Headlamp traffic-handedness". Danielsternlighting.com. 2008-01-28. Retrieved 2010-12-29. ^ a b McKernan, Megan (13 May 2015). "AAA Tests Shine High-Beam on Headlight Limitations". NewsRoom.AAA.com. AAA Automotive Research Center. Retrieved 3 July 2018. AAA’s test results suggest that halogen headlights, found in over 80 percent of vehicles on the road today, may fail to safely illuminate unlit roadways at speeds as low as 40 mph. ...high-beam settings on halogen headlights...may only provide enough light to safely stop at speeds of up to 48 mph, leaving drivers vulnerable at highway speeds...Additional testing found that while the advanced headlight technology found in HID and LED headlights illuminated dark roadways 25 percent further than their halogen counterparts, they still may fail to fully illuminate roadways at speeds greater than 45 mph. High-beam settings on these advanced headlights offered significant improvement over low-beam settings, lighting distances of up to 500 feet (equal to 55 mph). Despite the increase, even the most advanced headlights fall 60 percent short of the sight distance that the full light of day provides. ^ Varghese, Cherian; Shankar, Umesh (May 2007). "Passenger Vehicle Occupant Fatalities by Day and Night – A Contrast". Washington, DC: National Highway Traffic Safety Administration. National Center for Statistics and Analysis. The passenger vehicle occupant fatality rate at nighttime is about three times higher than the daytime rate. ...The data shows a higher percentage of passenger vehicle occupants killed in speeding-related crashes at nighttime. ^ Ruth v. Vroom, 245 Mich. 88, 222 N. W. 155, 62 A. L. R. 1528 , 245 Mich. 88 (Supreme Court of Michigan December 4, 1928) ("It is settled in this State that it is negligence as a matter of law to drive an automobile at night at such speed that it cannot be stopped within the distance that objects can be seen ahead of it; and, if a driver's vision is obscured by the lights of an approaching car, it is his duty to slacken speed and have his car under such control that he can stop immediately if necessary. ... The rule adopted by this court does not raise merely a rebuttable presumption of negligence. It is a rule of safety. ... It is not enough that a driver be able to begin to stop within the range of his vision, or that he use diligence to stop after discerning an object. The rule makes no allowance for delay in action."). ^ Lawyers Cooperative Publishing. New York Jurisprudence. Automobiles and Other Vehicles. Miamisburg, OH: LEXIS Publishing. p. § 720. OCLC 321177421. It is negligence as a matter of law to drive a motor vehicle at such a rate of speed that it cannot be stopped in time to avoid an obstruction discernible within the driver's length of vision ahead of him. This rule is known generally as the `assured clear distance ahead' rule * * * In application, the rule constantly changes as the motorist proceeds, and is measured at any moment by the distance between the motorist's vehicle and the limit of his vision ahead, or by the distance between the vehicle and any intermediate discernible static or forward-moving object in the street or highway ahead constituting an obstruction in his path. Such rule requires a motorist in the exercise of due care at all times to see, or to know from having seen, that the road is clear or apparently clear and safe for travel, a sufficient distance ahead to make it apparently safe to advance at the speed employed. ^ Gleason v. Lowe, 232 Mich. 300 , 232 Mich. 300 (Supreme Court of Michigan October 1, 1925) ("...every man must operate his automobile so that he can stop it within the range of his vision, whether it be daylight or darkness. It makes no difference what may obscure his vision, whether it be a brick wall or the darkness of nightfall. ... He must ... be able to see where he is going, and if his range of vision is 50 feet, if he can see 50 feet ahead of him, he must regulate his speed so that he can stop in a distance of 50 feet; if he can see 20 feet ahead of him, he must regulate his speed so that he can stop within 20 feet, and so on."). ^ Morris v. Jenrette Transport Co. , 235 N.C. 568 (Supreme Court of North Carolina May 21, 1952) ("It is not enough that the driver of plaintiff's automobile be able to begin to stop within the range of his lights, or that he exercise due diligence after seeing defendants' truck on the highway. He should have so driven that he could and would discover it, perform the manual acts necessary to stop, and bring the automobile to a complete stop within the range of his lights. When blinded by the lights of the oncoming car so that he could not see the required distance ahead, it was the duty of the driver within such distance from the point of blinding to bring his automobile to such control that he could stop immediately, and if he could not then see, he should have stopped. In failing to so drive he was guilty of negligence which patently caused or contributed to the collision with defendants' truck, resulting in injury to plaintiff. "...it was his duty to anticipate presence of others, [...] and hazards of the road, such as disabled vehicle, and, in the exercise of due care, to keep his automobile under such control as to be able to stop within the range of his lights"). ^ "New cars equipped with daytime running lights as of today" (Press release). Europa.eu. 13 May 2014. Retrieved 29 May 2014. ^ "Ya es ley el uso obligatorio de las luces bajas para circular de día". Clarín (in Spanish). 9 August 2001. Retrieved 29 May 2014. ^ Grueninger, Wes (5 March 2008). "Prometheus, Bound: The Difference Between American and European Car Lighting". MotiveMag.com. Archived from the original on 29 December 2010. Retrieved 29 May 2014. ^ "Headlamp industry veteran engineer's chronology & commentary on headlamp performance, glare & regulation". ^ Guyette, James E. (19 October 2012). "International Newsmaker Q&A: Daniel Stern". Searchautoparts.com. Retrieved 29 May 2014. ^ a b "Headlamp aiming specifications & procedures". Danielsternlighting.com. October 2012. Retrieved 29 May 2014. ^ a b c Christie, A.W. ; Ashwood, J.E. ; Symons, R.D.H. (1968). "Visual Acuity in Yellow Headlights" (PDF). RRL Report № LR 156. UK Ministry of Transport Road Research Laboratory. Retrieved 29 July 2018. ^ a b "White or Yellow Light for Vehicle Head-Lamps?". SWOV Publication 1976-2E. SWOV (Dutch Institute for Road Safety Research. 1976. Retrieved 29 July 2018. ^ a b Bullough, John; Mark S. Rea (2001). "Driving in Snow: Effect of Headlamp Color at Mesopic and Photopic Light Levels" (PDF). SAE Technical Paper Series. Archived from the original (PDF) on 2006-02-23. Retrieved 2010-01-27. ^ "New Zealand Vehicle Inspection Requirement Manual p. 4.1.2" (PDF). Landtransport.govt.nz. Retrieved 2012-01-31. ^ Icelandic Transport Authority US.321 Information on permitted headlight equipment on vehicles in Iceland. (46 KB) Archived 3 December 2013 at the Wayback MachineInformation on allowed headlight equipment. Umferðastofa Íslands "Archived copy". Archived from the original on 22 November 2013. Retrieved 25 November 2013. CS1 maint: Archived copy as title (link) Retrieved 2013-11-25. ^ Moore, David W. (June 1998). "Headlamp History and Harmonization". University of Michigan. Transportation Research Institute. Retrieved 7 August 2018. ^ a b United States Congress Senate Committee on Appropriations Subcommittee on Transportation and Related Agencies (1992). Department of Transportation and Related Agencies Appropriations for Fiscal Year 1993: Hearings Before a Subcommittee of the Committee on Appropriations, United States Senate, One Hundred Second Congress, Second Session, on H.R. 5518. U.S. Government Printing Office. p. 516. ISBN 9780160390456. Retrieved 7 August 2018. ^ a b "Rallying to the Call". Country Life: 98. May 1992. Retrieved 7 August 2018. ^ Official Journal of the European Communities: Information and notices, Volume 27. Office for Official Publications of the European Communities. 1984. Retrieved 7 August 2018. ^ Maloney, William A.; McLaughlin, Andrew (2005). The European Automobile Industry: Multi Level Governance, Policy and Politics. Routledge. p. 183. ISBN 9781134829262. Retrieved 7 August 2018. ^ "Science and Technology". The Economist. 322: 86. 1992. Retrieved 7 August 2018. ^ Ludvigsen Associates Ltd (1988). Research on the "Cost of Non-Europe": The EC 92 automobile sector (PDF). 11. Office for Official Publications of the European Communities. pp. 12, 54, 310–333. Retrieved 8 August 2018. ^ Commission Directive of 10 December 1991 adapting to technical progress Council Directive 76/756/EEC relating to the installation of lighting and light-signalling devices on motor vehicles and their trailers. 1991. Retrieved 8 August 2018. ^ Schoutheete, Philippe de (2000). The Case for Europe: Unity, Diversity, and Democracy in the European Union. Lynne Rienner Publishers. p. 47. ISBN 9781555879006. Retrieved 19 July 2018. ^ "Section 1: Eclairage et signalisation des véhicules". www.legifrance.gouv.fr (in French). Code de la route. Legifrance. Retrieved 7 August 2018. ^ a b c "Headlamp Optical Systems Illustrated, Explained & Compared". Webcitation.org. Archived from the original on 29 December 2010. Retrieved 31 January 2012. ^ Schumacher, Thomas W.; Hector Fratty; Guy Dorleans (1 February 1987). "Improvements in Low Beam Lighting Achieved by Complex Surface Reflectors". Society of Automotive Engineers. SAE Technical Paper Series. 1. doi:10.4271/870059. Archived from the original on 26 September 2009. Retrieved 29 May 2014. ^ Blusseau, Eric; Laurent Mottet (February 1997). "Complex Shape Headlamps: Eight Years of Experience". Society of Automotive Engineers. Retrieved 2009-05-06. ^ Donohue, R.J.; Joseph, B.W. (February 1973). "Faceted Reflector Fog Lamp Eliminates Lens Fluting". Society of Automotive Engineers. Archived from the original on 19 July 2009. Retrieved 6 May 2009. ^ Fujita, Takeshige; Takeo Ichihara; Hiroo Oyama (February 1987). "Development of Mr (Multi Reflector) Headlamp (Headlamp With Slant Angle of 60 Degrees, Contributable to Future Vehicle Body Styling)". Society of Automotive Engineers. Archived from the original on 27 May 2009. Retrieved 6 May 2009. ^ "Driving lights-was Re: headlight laws was re improving lightoutput - rec.autos.driving | Google Groups". Groups.google.com. 2003-12-06. Retrieved 2012-01-31. ^ Group, Techbriefs Media. "The Rebirth of the Incandescent Light Bulb". www.techbriefs.com. Retrieved 6 February 2019. ^ a b "Glare from Headlamps and other Front Mounted Lamps Federal Motor Vehicle Safety Standard No. 108; Lamps, Reflective Devices, and Associated Equipment". ^ a b "Be Careful: Dangerous Products! HID kits and the law". Hella. Archived from the original on 6 June 2010. Retrieved 29 May 2014. ^ "Nhtsa Illegal Lighting Crackdown Continues". Nhtsa.gov. 19 October 2004. Retrieved 29 May 2014. ^ Neumann, Rainer (1994). "Improved Projector Headlamps Using HID (Litronic) and Incandescent Bulbs". Retrieved 2014-12-13. ^ "49CFR564 Replaceable Bulb Headlamp Light Source List". Fmvss108.tripod.com. Retrieved 2010-12-29. ^ Sivak, M; Michael J. Flannagan; B. Schoettle (2006). "Mercury-free HID headlamps: glare and color rendering" (PDF). University of Michigan Transportation Research Institute. Retrieved 2009-08-03. ^ Flannagan, Michael J; Juha Luoma; A.W. Gellatly; M. Sivak (1992). "Ranges of stop sign chromaticity under tungsten-halogen and high-intensity discharge illumination". University of Michigan Transportation Research Institute. Retrieved 2009-08-03. ^ Flannagan, Michael J; M. Sivak (1989). "Colors of retroreflective traffic sign materials when illuminated by high-intensity-discharge headlights". University of Michigan Transportation Research Institute. Retrieved 2009-08-03. ^ Sivak, M; T Sato; D.S. Battle; E.C. Traube; Michael J. Flannagan (1993). "In-traffic evaluations of high-intensity discharge headlamps: overall performance and color appearance of objects". University of Michigan Transportation Research Institute. Retrieved 2009-08-03. ^ "Evaluation of High Intensity Discharge Automotive Forward Lighting" (PDF). Retrieved 2010-12-29. ^ "VISION Congress report". Drivingvisionnews.com. 2008-09-02. Retrieved 2010-12-29. ^ "Osram Automotive Lamps Lighting Programme 2005–06". Friarsmarketing.com. Archived from the original (PDF) on 12 June 2008. Retrieved 29 December 2010. ^ "The Difference Between US and European Lights". Motivemag.com. Archived from the original on 29 December 2010. Retrieved 29 December 2010. ^ "What Is Glare? p. 24" (PDF). Webcitation.org. Archived from the original (PDF) on 29 December 2010. Retrieved 31 January 2012. ^ "KOITO and DENSO Develop World's First Mercury-Free High-Intensity Discharge Headlamp System". Prnewswire.com. Archived from the original on 29 December 2010. Retrieved 29 December 2010. ^ "HID headlamp system has a newly developed mercury-free discharge bulb". Goliath.ecnext.com. 27 July 2004. Archived from the original on 29 December 2010. Retrieved 29 December 2010. ^ "Hella LED Headlamp Study" (Press release). Germancarfans.com. 18 April 2005. Archived from the original on 13 September 2005. Retrieved 29 May 2014. ^ "New-generation LED headlamp prototype with performance equal to HID". Fourtitude.com. Archived from the original on 29 December 2010. Retrieved 29 December 2010. ^ "Production LED headlamp technology & design as of 2007". Al-lighting.de. Archived from the original on 23 November 2010. Retrieved 29 December 2010. ^ "LED Headlights Introduced". TreeHugger. Retrieved 2009-11-29. ^ "DVN Interview with AL's Michael Hamm, 8 July 2009". Drivingvisionnews.com. Retrieved 2010-12-29. ^ "All-LED Projectors for Merc S-Class, 29 July 2013". Drivingvisionnews.com. Retrieved 2018-05-09. ^ Virginia Herndon (2014-01-20). "Laser light assists Audi drivers at Le Mans". Audiusa.com. Retrieved 2017-07-18. ^ Flannagan, Michael J.; Michael Sivak; Brandon Schoettle (November 2007). "Benefits of Headlamp Leveling and Cleaning for Current U.S. Low Beams" (PDF). UMTRI. Retrieved 2010-04-25. ^ "Myth or fact: The Citroën DS pioneered directional headlights". dsgoddess.com. Archived from the original on 1 March 2012. Retrieved 2009-11-29. ^ "EUREKA AFS task force". Memagazine.org. Archived from the original on 19 February 2012. Retrieved 31 January 2012. ^ pechmi2. "AFS on Skoda". Hella.com. Archived from the original on 14 February 2012. Retrieved 31 January 2012. ^ "AFS on Opel/Vauxhall Insignia". Netcarshow.com. Retrieved 2012-01-31. ^ "ABCs of AFS". Mvlc.info. 2012-01-27. Archived from the original on 6 October 2011. Retrieved 2012-01-31. ^ "Predictive AFS via GPS Nav data" (PDF). Ieeexplore.ieee.org. Retrieved 2012-01-31. ^ "Jacob Rabinow - patent 2917664". Museum.nist.gov. Archived from the original on 30 May 2014. Retrieved 20 May 2014. ^ Rabinow, Jacob (May 1990). Inventing for Fun and Profit. San Francisco Press. ISBN 978-0-911302-64-6. ^ "Built In Visor Shades Headlamps". Popular Mechanics. 106 (2): 70. August 1956. Retrieved 29 May 2014. ^ a b "Daimler: New headlamp and night-view systems" (Press release). Media.daimler.com. 12 November 2008. Archived from the original on 2 February 2014. Retrieved 29 May 2014. ^ "Adaptive Highbeam Assist - the Intelligent Headlamp". Archived from the original on 21 February 2014. Retrieved 29 May 2014. ^ Seekircher, Jürgen; Woltermann, Bernd; Gern, Axel; Janssen, Reinhard; Mehren, Dirk; Lallinger, Martin (January 2009). "The Car Learns How to See - Camera-Based Assistance Systems". Springer Automotive Media. Retrieved 29 May 2014. ^ "Fascinating light - dynamics through technology and design" (Press release). Hella. 9 February 2010. Archived from the original on 2 February 2014. Retrieved 29 May 2014. ^ "Lighting technology" (PDF). Retrieved 17 February 2010. ^ "Mobileye & Visteon". Retrieved 18 February 2010. ^ "Adaptive Lighting Systems". Driving Vision News. 2010-08-31. Retrieved 2012-01-31. ^ "New Touareg takes the SUV idea into the future". Archived from the original on 3 March 2012. Retrieved 17 February 2010. ^ "The New Volkswagen Touareg SUV is One of the Safest Automobiles of All Time". Archived from the original on 13 March 2012. Retrieved 17 March 2010. ^ "Phaeton debuts with new design and new technologies". Archived from the original on 20 July 2011. Retrieved 22 April 2010.